In little over 10 weeks, I will have sung (however amateur) a most magnificent and intensely challenging choral work called Ein deutsches Requiem, nach Worten der Heiligen Schrift – A German Requiem, to the Words of the Holy Scripture. 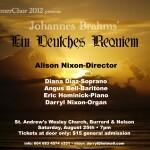 Johannes Brahms wrote this huge work of seven movements in 1868 and on August 25, 2012, the Summer Chor, directed by Alison Nixon, will present Brahms’ masterpiece in a big stone church in downtown Vancouver. Even if you don’t believe in God, or you don’t think you like classical music, I really do think that there is something special in this event that almost anyone can enjoy. Imagine producing an expression of your thoughts and feelings in a manner that resonates with so many, it gets reproduced 144 years after its creation. Contrary to the words we sing, it does not feel like we’re singing about or to God in the same way when we sing hymns in English. Once I actually mark my music with translations, this may change. But really what I mean to say is this sacred music is in a class of its own. 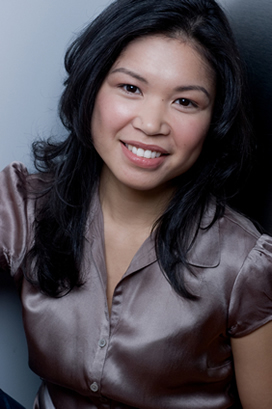 Despite the language barrier, the music, sung in all four choral parts with piano and organ, offer up a journey of the human spirit through valleys and sunsets. We started rehearsals in June, and for the first rehearsal I listened; barely singing a note due to an overwhelming sense of incompetence. There is so much to coordinate: pitch, placement of vowels, making sense of German, rhythm, breathe support, dynamics (is it soft, quick, loud, lyrical etc.? ), looking at the conductor and the music. And then there is the fact that one singing does not really hear how one truly sounds. If you have ever recorded your voice, played it back and heared a voice slightly different from what you hear when you speak, you will know this to be true for singing as well. It is the only musical instrument of its kind with the complication of human anatomy for producing and perceiving sound. I cycled around the city again after 5 weeks of limited movement and I am so happy for it. It’s been a year since I’ve visited one of my favourite local grocers in the Mt. Pleasant neighbourhood, Home Grow-In, and it felt great to return and see how much they have grown. Deb and her staff are so friendly and helpful and the atmosphere is one of conscious community that loves the Earth and its bounty. They have chairs outside to relax and enjoy the freshly delivered produce that comes from within 100 miles of the city. I took a few minutes to sit and enjoy an orange and freshly baked multi-grain bread. It was very simple and yet satisfying for a snack. This one act of taking the time to seek out quality nourishment in a practice of yoga, exercise and fresh vegetables completely shifted my state well-being to one lighter and less worrisome than when I had left the house. I was just scrolling my facebook home page where it highlights all the status postings of my facebook friends. While I appreciated the updates on people’s thoughts and happenings, I recognized a sad truth: I am content to read about friends on facebook without participating much beyond being witness. And likely, many more months and years will pass in which I will miss having any direct human connection with some of these friends. Does that kind of engagement still qualify as “friend” in the way that I want “friend” to be? I’ll speak now to another experience today that seems unrelated but will explain later. I just attended the live tv recording of the Canadian Country Music Awards at GM Place and while yes, many more were able to view it at home on their televisions, there is nothing that will ever replace the experience of witnessing a live performance. Social online medias, tv, films, video recordings on mobile phones, even video conferencing; while all are extremely valuable and create opportunities to communicate at much higher rates of efficiency than a knock on the door or stage productions, they will never satisfy a basic human desire to be present with each other live! Eye to eye, voice to ear, hand to hand, energetic human vibrations! As I’ve written this, I am in awe of the space that we have in this world via the internet and this website, to give voice to our thoughts. That is something incredibly powerful and amazing that humans have created this ability to access ideas, thoughts, images and sounds globally, instantaneously. And the results of my words getting out into cyberspace, I cannot control nor fully know. And yet, it feels lonely still. Sure, one can reach a potentially wider audience using a television broadcast, making a film or adding faces on facebook, but when I look back on the experiences of my day, it was all the person to person experiences that were the most satisfying. When I sat in a venue filled with thousands of enthusiastic people cheering for the accomplishments of artists, when I sat across the table from a friend smiling and sharing stories over dinner, when I could hug my friend who made it possible for me to attend the music awards, and yell and poke his arm (not a facebook poke!) with excitement when my favourite artist came on to perform, these are moments unsurpassed and irreplaceable by technologies. And so what was all this to express? Well, I guess I’m just reflecting upon the development of a habit to be passive when so much of technology affords us the convenience to be so. It is so easy not to make the effort to look someone in the eye because there is a text message to answer, or to gather with community, friends and family because facebook just updates us anyway, to go to live theatre because cable comes right into the home. I am reminding myself to spend time in-person and be present with people and places and other living creatures that I care for as often as I can, Today! The technology is meant to facilitate it, not give an excuse or distraction not to! Today was a nice balance.